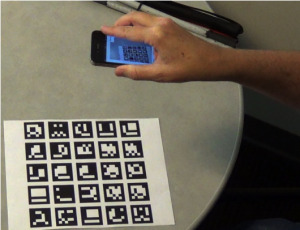 A participant positioning an iPhone over a document printed with ArUco fiducials. Jack Baskin School of Engineering alumnus Michael Cutter has been internationally recognized for his work “Towards Mobile OCR: How to Take a Good Picture of a Document without Sight.” The paper was co-authored by Computer Engineering professor Roberto Manduchi, Cutter’s advisor when he was a PhD student at UCSC. The paper was unanimously judged Best Student Paper at the 15th Association for Computing Machinery (ACM) Special Interest Group on Hypertext and the Web International Symposium on Document Engineering (DocEng), held this September in Lausanne, Switzerland. Cutter and Manduchi embodied the objectives of the symposium in their exploration of the unique challenges facing a subset of the population that is often unable to access documents: those without sight. “[W]e spent a lot of time understanding the difficulties a blind person faces in order to acquire a good optical character recognition (OCR) readable image,” Cutter said. Currently, OCR applications in smartphones “hold great promise for enabling blind people to access printed information” but are hindered by how difficult it is to take a well-framed image of a document without sight. In their work, Cutter and Manduchi developed and applied experimental software to see if verbal guidance could aid people without sight in acquiring OCR-readable images. The performance and feedback from participants have inspired Cutter and Manduchi to continue their investigation. “In our (currently unpublished) follow up work, we applied these design insights and created an application which allows a blind person to rapidly OCR a document in its entirety,” Cutter said. DocEng is a leading international ACM symposium for researchers, practitioners, developers, and users to explore cutting-edge ideas and to exchange techniques, tools, and experiences in the domain of document engineering. The symposium emphasizes innovative approaches to document engineering technology, use of documents and document collections in real world applications, novel principles, tools and processes that improve our ability to create, manage, maintain, share, and productively use these.